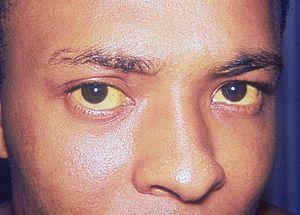 Yellow colored skin and yellowing of the sclera of the eyes (white parts of the eyes) indicates that the person has jaundice or icterus. In some cases, even different body fluids may turn to yellow color if the patient is suffering from this condition. The cause of yellowing lies in the accumulation of substance known as bilirubin in the blood. This substance is normally produced in the human body after metabolism of red blood cells. After that, bilirubin is being transported to the liver and filtered and excreted from the kidneys in urine. However, if a person has some liver or biliary system problems, the body produces too much bilirubin and causes jaundice. Yellowing of the skin and eyes may affect both children and adults, regardless of the age. Newborn children are very frequently diagnosed with jaundice. Baby’s liver is not yet developed properly and therefore can’t function and remove bilirubin as it should. Although it may look weird, this condition is not something to be afraid or worry about. Most babies get completely cured without any treatment in few weeks. In older children and adults jaundice may be the result of several causes, including: anemia, metabolism problems, liver diseases, use of certain drugs or obstruction of the bile duct. Hemolytic jaundice is commonly related to patients suffering from anemia or metabolism problems. As the direct result of these diseases, patient’s body breaks down many red blood cells and therefore produces too much bilirubin, leading to yellowing of the eyes and skin. Hepatocellular jaundice affects hepatitis, cirrhosis and liver failure patients, as well as people prescribed with some medications. This is very common cause of jaundice, where bilirubin can’t leave the liver and thus can’t be excreted in urine. Obstructive jaundice appears in patients suffering from blockage of the bile duct. It is frequently seen in cases of gallstones, bile duct or pancreas cysts or tumors. Is There a Way to Prevent Jaundice? It may be difficult to prevent jaundice occurring because of some underlying medical problems, but it can be done. Healthy lifestyle and regular physical activity is recommended by the doctors as the best way to keep your liver functional and healthy. Alcohol may seriously damage your liver. Because of that, limit the amount of alcohol you consume to not more than 2 or 3 units per day. This means that women should not drink more than a glass of vine, sherry or port, or half of a pint of lager or cider. Men are allowed to drink little bit more and they could take a pint or pint and a half of lager or some 2 glasses of wine, if they want to protect their liver. Jaundice home remedies - Too late? Could liver biopsy cause damage?